FREE again for a limited time – What Will I Be?, a delightful story from Digital Leaf. 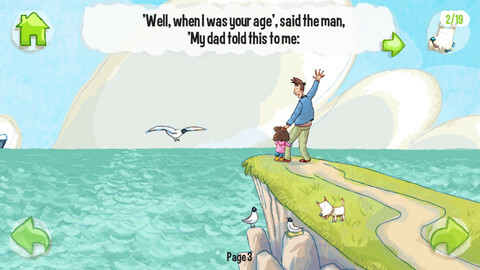 A father answers his child’s questions about the future in this educational app that encourages children to dream big! Before the story starts, the app permits you to choose the gender of the child. The story is cute and written in rhyme with interactivity throughout – sounds and things to move. Kids are encouraged to find “the dog” hidden in 19 places throughout the story. If they do, a bonus game is unlocked. This app is a perfect example of what a digital story should be – a great story with interactivity that enhances the overall reading experience. And… as an extra added bonus, the story send a positive message to kids! Don’t miss out on this one – perfect to read in the classroom when talking/writing about careers or the future!